Open Tuesday - Sunday 10 a.m. - 5 p.m. September through June. Open select Mondays during school holidays including April 22, 2019. Closed Memorial Day, Independence Day, Labor Day, Thanksgiving, Christmas, New Year's Day and Fall Fix-Up (September 4 - September 14, 2018). We post a field trip forecast every week on Facebook and in our weekly eBulletin to help you plan your visit. We are located on Charles Lindbergh Blvd. on Museum Row with free parking. 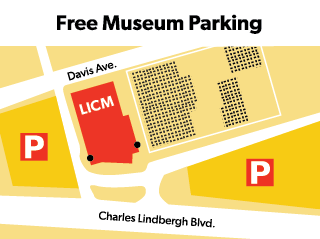 The Museum is a community resource for all families We are fully accessible and offer resources and activities to make each visitors' experience more enjoyable through our LICM4all initiative. Take a 360° tour as you walk through our 14 interactive galleries. Step into TotSpot for kids under 4, take a peek from the inner lobby, or start your journey up on our second floor. Baby changing tables are available in every restroom. Nursing is allowed anywhere in the Museum, and a private nursing area is available in the TotSpot exhibit on the first floor. A coat room is available in the outer lobby for visitor use. Locker keys are available at the front desk; a refundable deposit ($5) is required. Please be advised that valuables should not be left in this area. A cafeteria with vended services is available on the first floor of the Museum. Visitors are welcome to bring their own food for consumption in our cafeteria. Please note that food and drinks are restricted to the cafeteria. Groups must call in advance to reserve cafeteria space. Cafeteria Tip: Please keep in mind that the Cafeteria is busiest between 11:30 – noon. Plan accordingly. Lost and found is located at the Lobby Information Desk. Please call our Lost and Found department at (516) 224-5801 with any questions. Strollers may be used throughout the Museum. A small stroller parking site is available on the first floor on a first come, first serve basis. Strollers may also be left in the coatroom. Valuables should not be left in unattended strollers. To provide LICM guests with the highest possible experience, exhibit maintenance is occasionally necessary during museum hours. Galleries may be closed during your visit to address these repairs. The cafeteria and certain exhibits may be closed during the day to accommodate educational programs and private groups. If the cafeteria is in use, we will do our best to accommodate visitors with another eating space during these times. LICM reserves the right to ask visitors who do not behave appropriately to leave the museum immediately. LICM will make reasonable accommodations for individuals with disabilities. Advance notice is appreciated. Adults will not be permitted in the Museum without children. All Museum visitors under 18 years of age must be accompanied by an adult at all times. Partnerships and programs with local business provide discounts for members and visitors.